Carlsbad City Councilwoman Farrah Golshan Douglas resigned today, citing pressing personal and family commitments. Douglas, an unsuccessful Assembly candidate in 2012, will step down at 5 p.m. Friday. Her term was set to expire after November’s general election. Carlsbad city councilwoman Farrah Golshan Douglas. Photo courtesy City of Carlsbad. “Knowing how difficult it can be to balance personal and family commitments with the immense sense of duty we all bring to our roles on the City Council, I respect her decision to step down and thank her for the significant contributions she has made to our city,” Mayor Matt Hall said. The City Council will decide how to fill her position at an upcoming meeting. City rules allow for a special election or the appointment of a replacement. 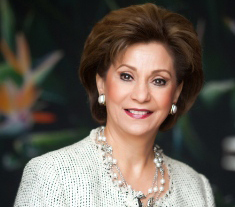 “Farrah made a significant contribution during her time as a council member, including helping the city be more business-friendly, working to make the desalination project a reality and initiating efforts to bring an institution of higher education to Carlsbad,” Hall said. Besides serving on the City Council, Douglas runs the Tri-City Hospital Foundation. She co-owned a printing business for 23 years.